After his notable performance in the movie In The Name Of Love, Jake Cuenca is slated to do a new movie entitled Ang Huling El Bimbo under Star Cinema . It came as a big surprise on Jake’s part since he only learned about the project during Star Cinema’s trade launch last June 16. “I don’t know the details yet. Seryoso, nagulat ako. While waiting for my turn to perform backstage, I was watching the VTR. 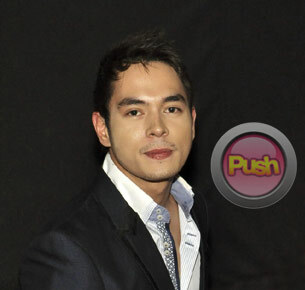 Then nakita ko na lang na kasama ako sa isa sa mga upcoming projects nila, ‘Uy pangalan ko ‘yan!’ Based sa napanood ko ha, makakasama ko sila Coco Martin, Enchong Dee, Enrique Gil and Martin del Rosario,” he said in an interview with Push.com.ph. If the project pushes through, Jake further shared that it would be great to be able to work again with his former Tayong Dalawa co-star Coco Martin. In fact, he would have preferred it if the project also includes their good friend Gerald Anderson. As it is, Gerald was listening in our interview and was teasing Jake about leaving him out of the project. In the meantime, Jake expressed his gratitude to Star Cinema for tapping him for another big project. “Oo nga eh. Siyempre blessing yun para pagkatiwalaan ako ng Star Cinema ng ganito. Coming from a big movie, gusto ko lang ipagpatuloy ang pag-improve ng craft ko, yung pag-aaral ko ng pagarte. And I just want to apply everything I’ve learned with my every project,” he finally stated.